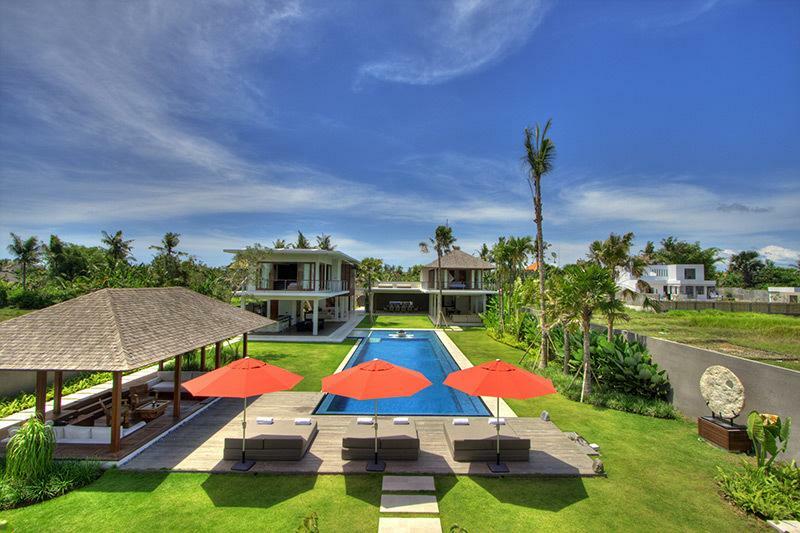 Villa Kalyani is a spectacular five bedroom property resting on 2,250-square-metres of land, just one kilometre from Berawa Beach near Canggu on Bali’s south-west coast. 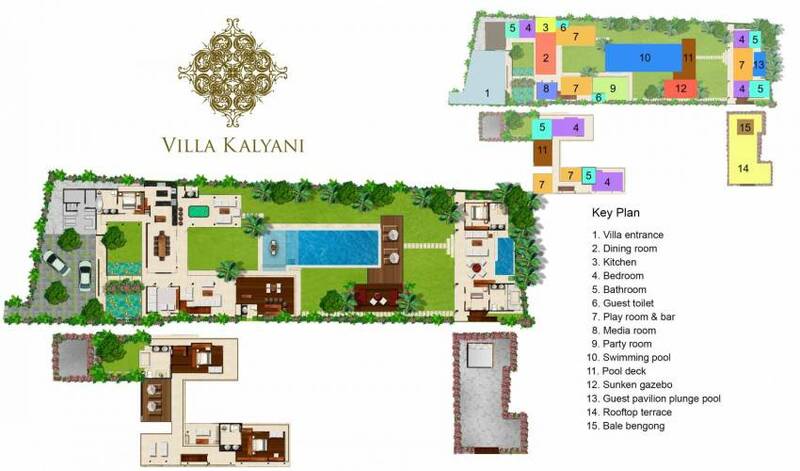 Complete with a 22-metre swimming pool, this huge and hi-tech villa offers numerous relaxation, entertainment and recreation areas, ensuring that guests will always find a private spot for peace and quiet, somewhere to laze in the sun, to dance, to play games, or watch movies both indoors and out. 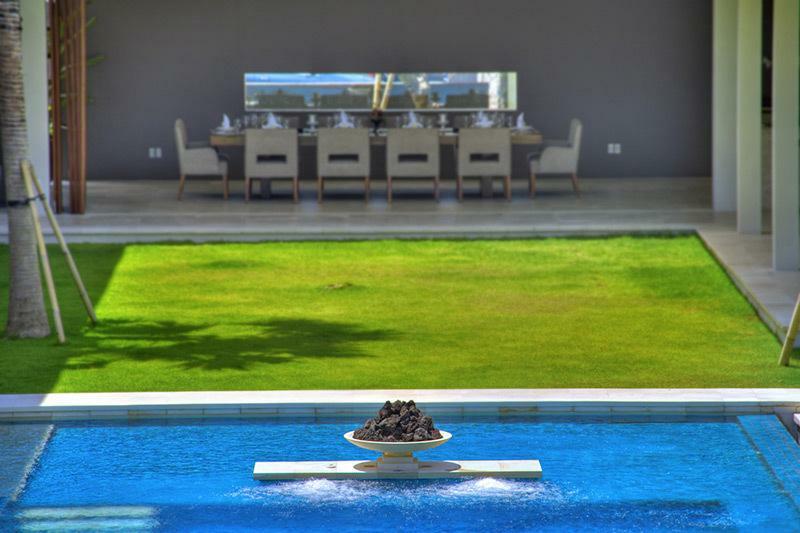 Perfect for families, friends, parties and weddings, the villa is fully staffed by a professional team including butlers, a gourmet chef and security guards. A car with driver is available at a special rate. 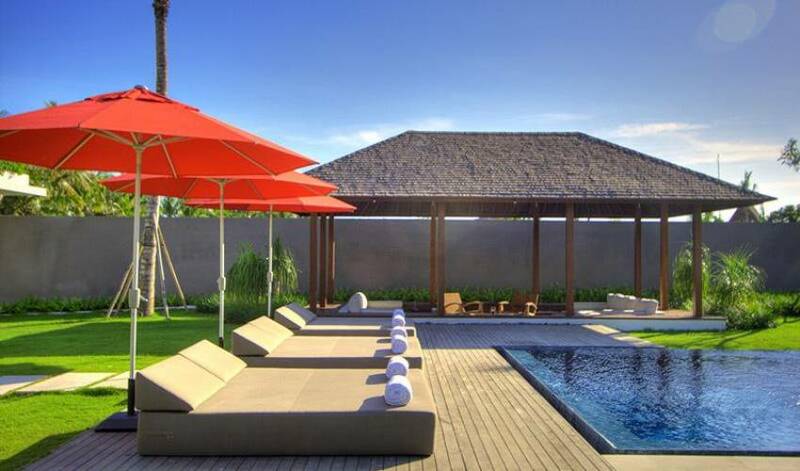 The villa is perfectly set up for families or groups of friends in search of a chilled-out five-star holiday experience, as well as being wired for sound for those looking to host weddings and parties. We have two bars, a dance floor, a professional DJ booth, a large rooftop reception terrace, and generous lawns for gatherings of up to 120 people. Our professional staff will go out of their way to ensure that your stay is as memorable as can be, providing polished service and gourmet food. Furthermore, if you wish to head out to explore the island’s many delights, a car and driver are at your disposal. 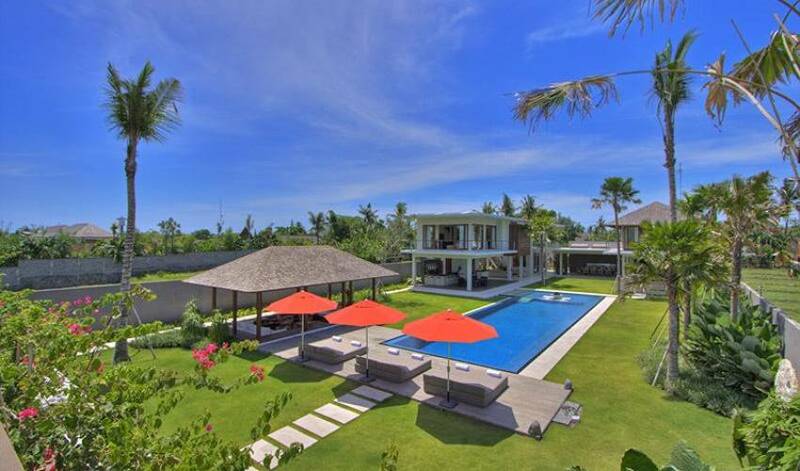 Less than two kilometres from Bali’s south-west ‘sunset’ coast, the villa’s location is ideal for those who wish to play at the beach or revel in Bali’s rural charm, while still being close to Seminyak’s vibrant social scene. 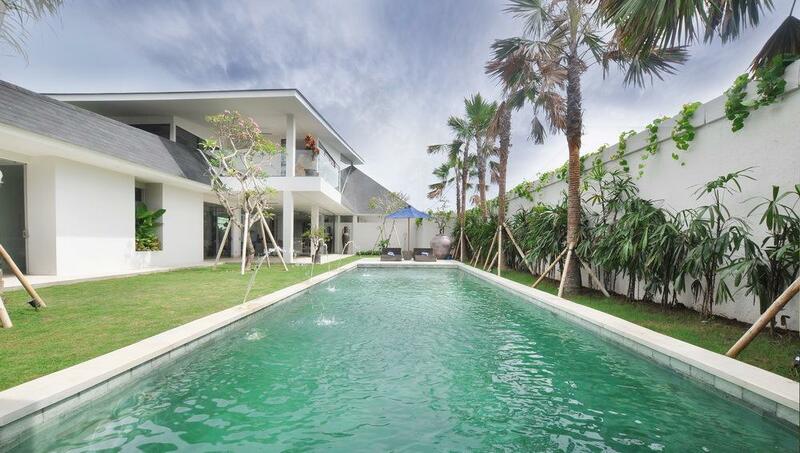 The villa comprises a large two-storey, U-shaped building housing three bedrooms and the entertainment areas and a single-storey guest pavilion at the base of the garden with two bedrooms, a living area and a plunge pool. Between these two buildings is a 22-metre swimming pool and lawn. There are myriad entertainment areas on the first and ground floors including a formal dining room, kitchen, a games lounge with pool table and bar, a party area with professional DJ booth and dance floor and bar, a media room and sun decks both on the roof and beside the swimming pool. 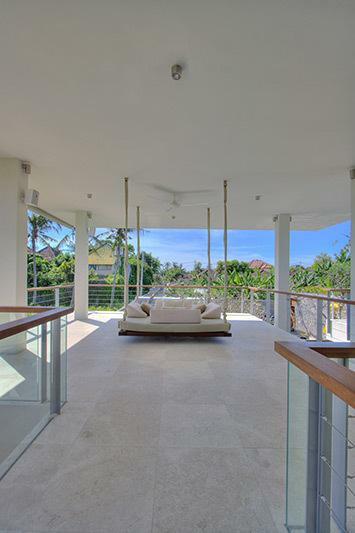 There are not many villas in Bali that offer a purpose-built party space complete with a bar, professional DJ booth and dance floor. Open-sided and facing the garden party room is most definitely the place to get your groove on all night long. And when you need to take a break from dancing, there’s an adjacent lounge area with soft-seat couches for up to 15 people. 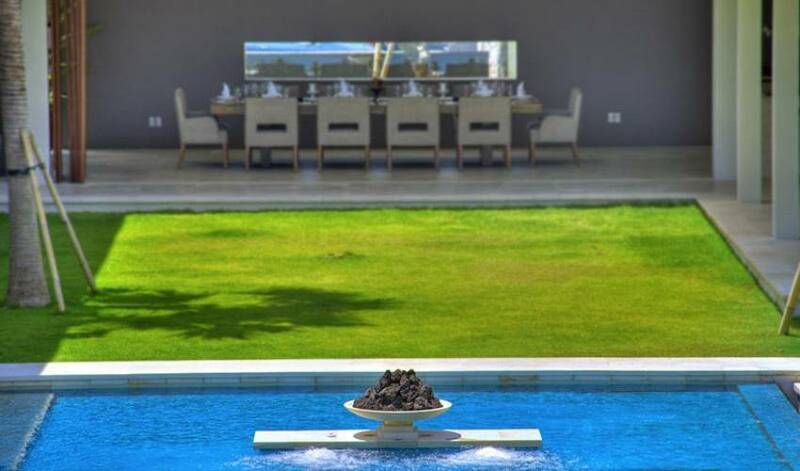 Centrally positioned in the main building and furnished with a large wooden table for 12 people, the villa’s dining room can be closed off for air-conditioned comfort and provides the perfect setting in which to savour the exceptional cuisine prepared by the villa’s private chef and his team. 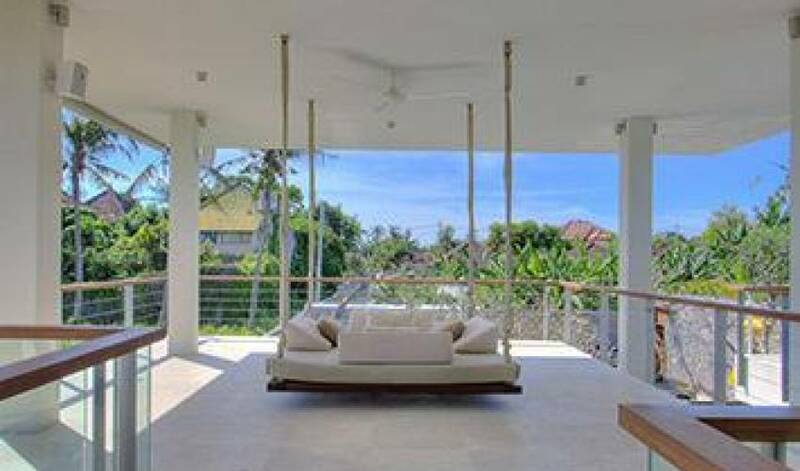 Between the upper level master bedrooms are two fun outdoor spaces; one with a swinging cushioned daybed suspended from the ceiling, and the other presenting a wooden sundeck with two double sun loungers for private tanning. 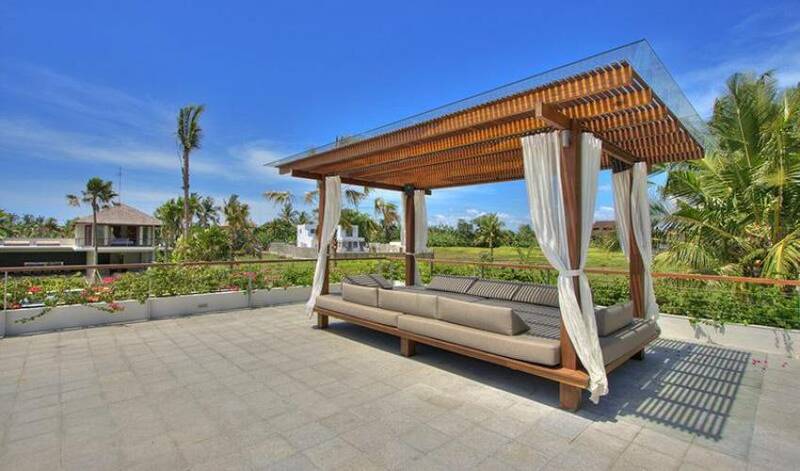 More top-level outdoor living space can be found above guest bedrooms 4 & 5, where an expansive roof terrace offers broad views while a bale bengongrelaxation pavilion provides shade. The terrace is ideal for receptions and especially good at sunset or after dark when the temperature has dropped. With a high-pitched wooden ceiling suspended over hardwood floors, together with a king-size bed, comfortable soft furnishings and balconies on two sides looking out over the pool and garden, this master bedroom will induce nothing but extreme contentment for those lucky enough to draw the winning straw. The jewel in its crown, however, must be the gargantuan ensuite bathroom with its vast soaking tub and private garden. 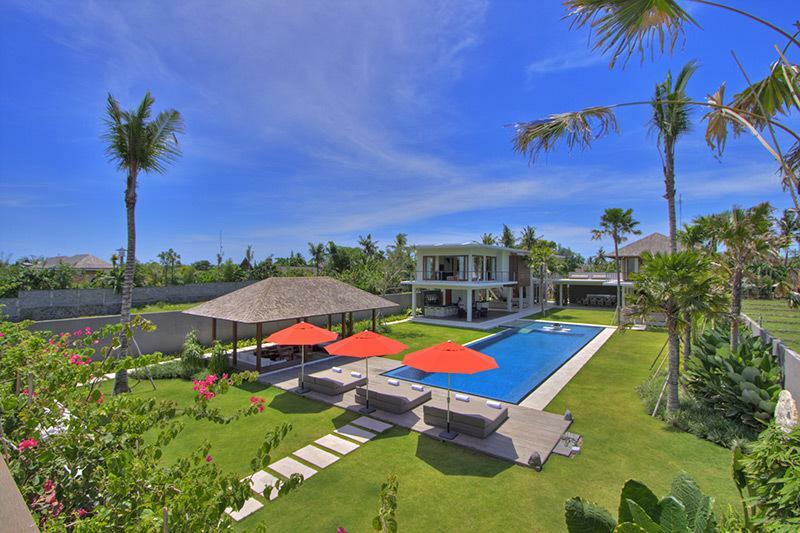 Similar in size to the first master bedroom, this second upstairs master room is equipped with a king-size bed and its own wrap-around terrace overlooking the pool and garden. With its earthy tones, hardwood floors, comfortable furnishings and very spacious bathroom, this suite is bound to impress. Furnished with a king-size bed which converts into twins and large ensuite bathroom compete with soaking tub, bedroom 4 is discreetly tucked away behind the dining room. The room looks out across a neat lawn to a waterwall and ornamental pond, allowing guests to drift into dream-time to the soothing sounds of falling water. Located at the far end of the garden, either side of a covered but open-sided living area, these two super-comfortable rooms have king-size beds, ensuite bathrooms and great views out over the lawn and pool. 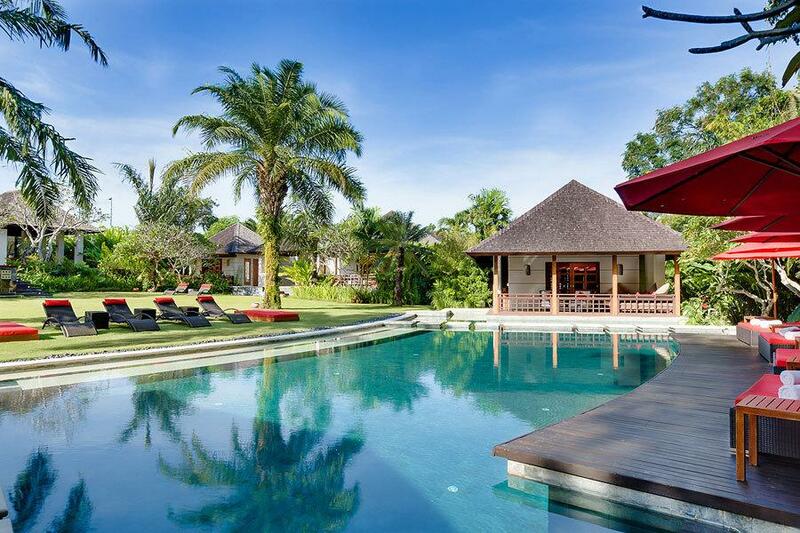 A 7 x 3 metre plunge pool adds to the luxury of this guest pavilion. 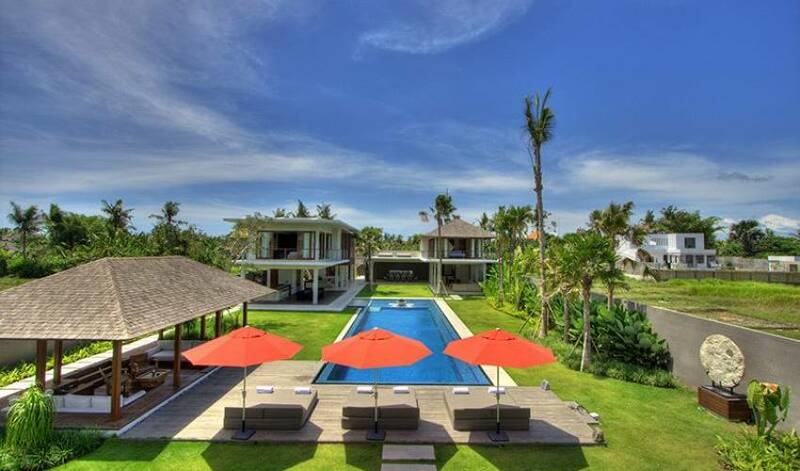 Villa Kalyani is in a quiet street in the rural village of Berawa, near Canggu. 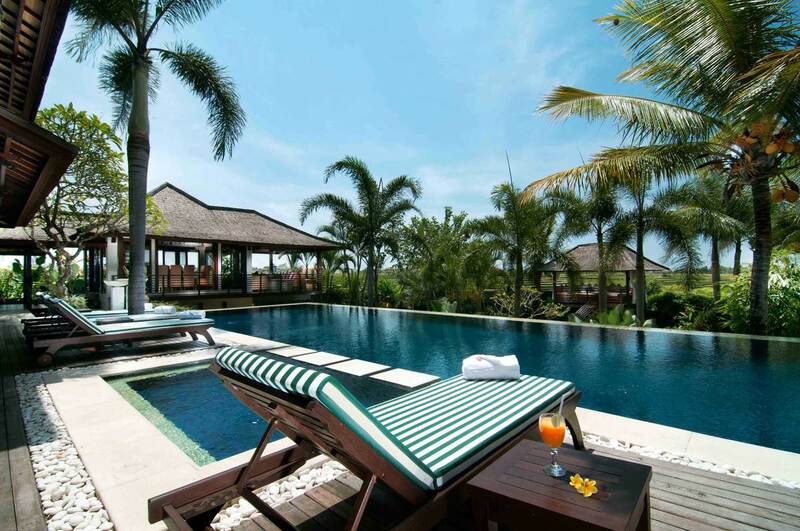 In the area around the villa are a sprinkling of other luxury villas, some picturesque terraced rice fields and the rugged surf beach of Berawa (2km). 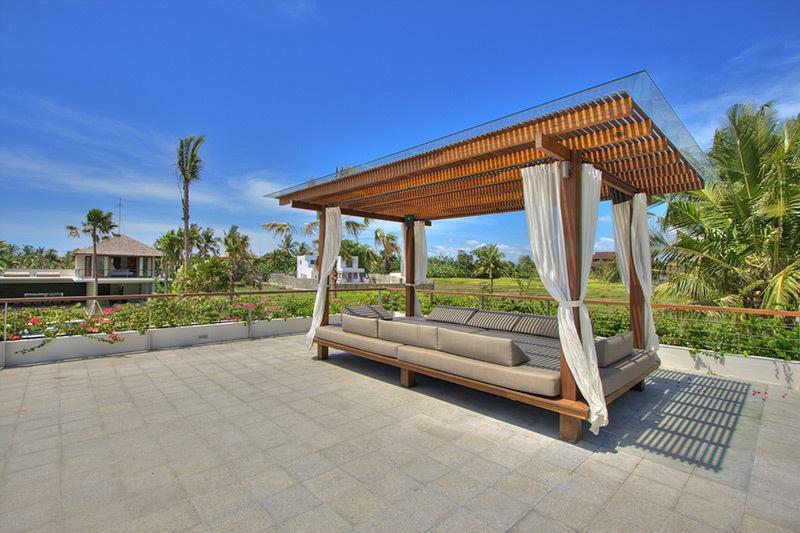 Within two kilometres is the Canggu Plaza, a food court and small shopping precinct presenting Trattoria Cucina Italiana restaurant, Suksema sushi, Champagne and Oyster bar, Bossa Nova Brazilian Grill, a beauty care centre, an ATM and a couple of boutiques. 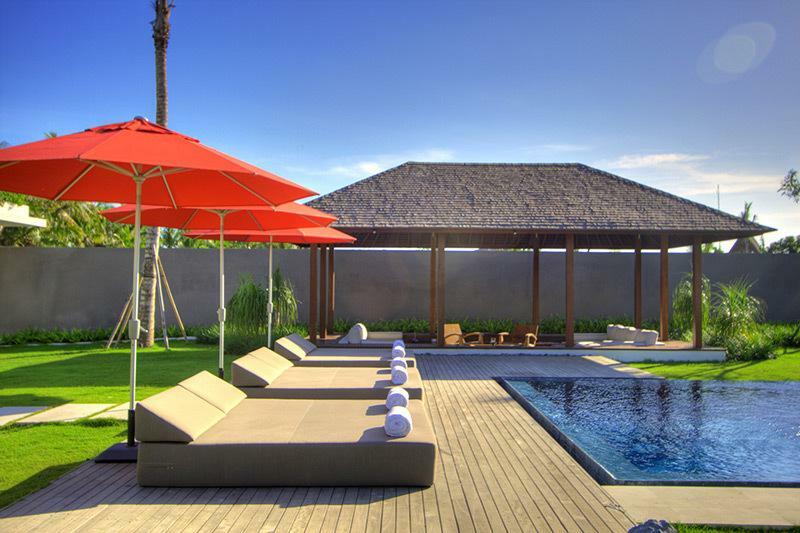 Next to this is the Canggu Deli and the Canggu Club, and nearby are some café-style restaurants, simple spas, and a yoga centre.